Scientists running the Phoenix Mars Lander mission are starting to sift through new data being sent back to earth from soil samples the craft has scooped from the Martian surface. At a briefing today, mission managers said they're getting twice the amount of data as they expected. They're especially excited by the "bright material" exposed on the Martian surface as the Phoenix scooped up soil. The image at right shows the material in two trenches dug by the scoop (the trench on the left is dubbed "Dodo" and the one on the right is "Goldilocks"). The material appears to be ice, but some scientists say it could be a salt layer. Over the next few days, they'll start scraping off samples of the "bright material "and placing them in the Phoenix's Thermal and Evolved-Gas Analyzer (TEGA) and microscope to determine the answer. The soil sample scooped from "Goldilocks" was sprinkled into TEGA for analysis. (The sample itself was nicknamed "Baby Bear" - I'm sensing a theme here.) It yielded the first microscopic images of Martian soil sent back by Phoenix. 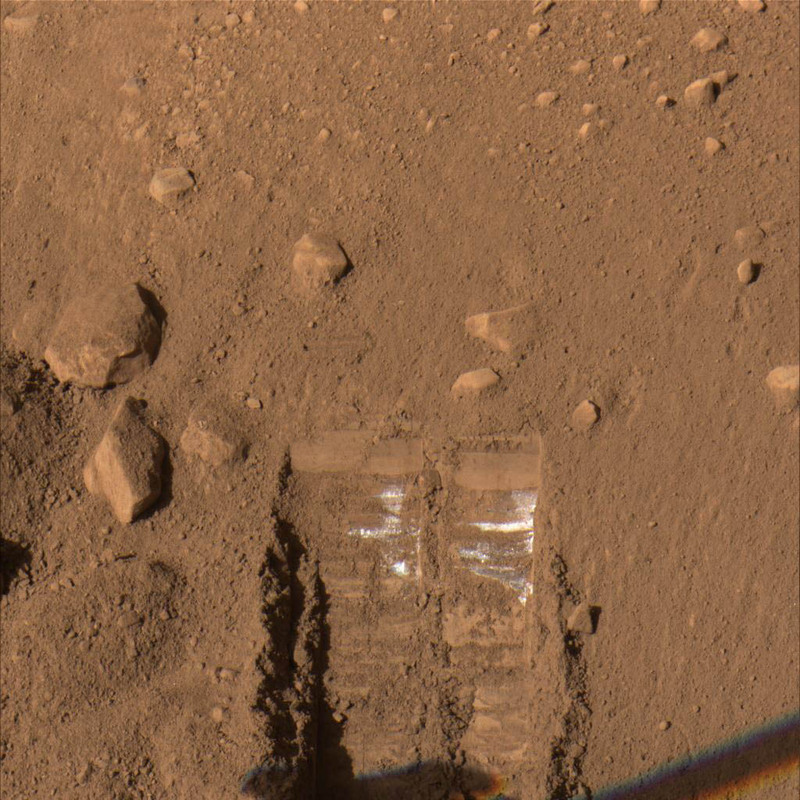 The image below and to the right is the first soil sample studied aboard a Mars lander since the Viking missions of the 1970s, and it's the highest resolution image ever seen of Martian soil. It shows the soil sprinkled on a silicone substrate. 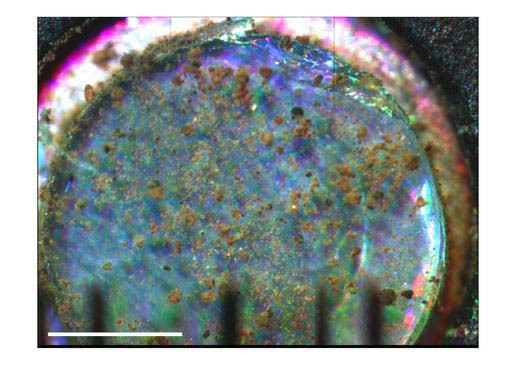 Closer examination reveals particles with a green tinge, possibly indicating the mineral olivine. Mission managers say they'll have more detailed analyses of the soil from TEGA next week. Have they ruled out the possibility that the "bright material" is paint or other material (e.g., zinc, cadmium, stainless steel, etc.) transferred from the back of the scoop to the soil (i.e., Earth material and not Martian material)? I don't know if the scoop is metal or polymer, but I assume it's metal. I'm just asking here, but it kinda looks like paint transfer from a new shovel to me. present. Other life must be out there somewhere...more info please!!!! Totally kewl.... Gathering Martian soil samples... What kind of organisms are in the dirt? there is water on mars. 2 polar ice caps on both poles. just google image search mars. Yuor guys did more with 460 million budget, then entire us congress can do with trillions! shame on them, cheers to your team. 3. No organisms yet that we know of. It would be front page news if there were (I would hope). 4. Yes, there is water on mars, although there is some significant "Dry Ice" (Frozen Carbon Dioxide) in those ice caps during the winter months. I too applaud NASA for doing as best they can with the limited budgets they have. Although I am still dismayed at the stinginess of our government and industry to really put forth more of an effort for these programs. While I think the government gets a lot of deserved ridicule for its inefficiencies, we really need to continue to invest in hard science like this. Our economic well being is not only being eroded by our dependence on oil, but also on the decline in our technological knowhow. Phoenix soils itself ? but who will change the diapers ? Perhaps the solution should have been contracted out. Japan makes more advanced robots. What will the Martians think ? Their first contact with Primitive Polluter. Doesn't it seem too close-minded to say that it is EITHER salt or ice, eliminating all other possibilities? Perhaps Phoenix bumped the quasi-metallo-crystaline roof of a martian subterranean city? Or it struck the layer of martian fungus that exists just below the surface of the ground, deep enough to avoid the worst of the unfiltered ultraviolet radiation, but shallow enough to gather some solar energy while also utilizing buried moisture. Or Phoenix is actually on the same sound stage the fake moon landings were filmed on and somebody forgot to bury the papier-mache set deeper when preparing for the scoop-photos. "Or I should stop guessing and wait for the real data to come in…"
It disappeared. Now we will newer know for shure ! I want to thank you for explaining things in layman ways. I really enjoy you're enjoyment of current events. We are living in evenful times and you're discriptive explanations are quite well received. maybe people like you, with a microphone, can awaken us americans to be the next greatest generation. A great day to you..sir. The most curious aspect of this find to me is that the uncovered ice is sublimating. Returning an atmoshpere would be as simple as blowing all the dust off the ice. Now if we just knew where all the nitrogen is at...there is where the life would be. Perhaps beneath the ice? "Now if we just knew where all the nitrogen is"
Blown away by the Carrington Solar Flares. Hiding is the only reason some CO2 and H2O are still there. In the (above) June 13 article, "Phoenix soils itself", there is an image from a microscope. I want to see the full-resolution version, but couldn't find it anywhere on the web using Google. Not even going to the University of Arizona web site. Where's the original?